Will the customer buy what governments demand? Dave Guilford is news editor for Automotive News. 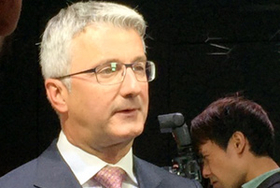 PARIS -- Audi CEO Rupert Stadler says that after a global wave of new emissions and fuel economy regulations, the automotive industry needs a break. In doing so, he's warning about the unintended consequences of rapid regulatory change. Stadler's not looking for a break from meeting standards like the U.S. 54.5 mpg CAFÉ goal, or the European Union's target of 95 grams of CO2 emissions per kilometer driven by 2020 -- but a break from new, more aggressive rules. Stadler's comments, which echoed remarks by VW Group CEO Martin Winterkorn on Wednesday, seemed especially attuned to talk about tougher EU emissions standards, perhaps as low as 65 g/km by 2025. Stadler: "We have to see if the customer is coming with us." The problem, in Stadler's view, is that meeting the regs is not exclusively a matter of technology. Tougher rules could actually be counterproductive if they weaken automakers financially by mandating products that consumers reject. "We have to comply," he said in an interview during Paris auto show press days. "And we have to see if the customer is coming with us." He said CO2 is the biggest challenge the industry faces, adding that regulations in the EU, U.S. and China are very close to each other. The industry is making progress, but with technologies like electric vehicles and plug-in hybrids just rolling out, "it is far too early to know if the market is going to respond," Stadler said. That, in turn, will determine whether automakers have the financial muscle to afford to develop technology further, he added. "We need a lot of technologies," Stadler said. "You need to have a strong company, financial power. You need to have the best engineers on board, and then you can say, 'This technology, this market.'"